I suppose it shouldn't have been so shocking. After all, some restaurants seem to think it OK to make up the minimum wage with customer tips. At least there, we can leave cash tips to stop the practice. But the idea that some leading hotel groups are effectively employing room attendants (as chambermaids are now called), who rarely receive tips, to clean rooms that can go for £200-300 a night for rates of less than £3 an hour is shocking in 2009 Britain. Last night's Newsnight showed how staff were illegally being paid on the basis that they only got the minimum wage if they cleaned 2.5 rooms an hour, regardless of size. Then some bizarre formula was used to ensure that staff got rather less than they were legally owed. The minimum hourly wage of £5.73 is hardly a king's ransom. If you haven't seen last night's Newsnight report, do watch it while it is still on the i-player. I trust, if the evidence from the BBC's investigations is shown to be correct, that the company involved here will receive a stiff fine to show that the minimum wage is just that. As consumers, we should start to demand a Fair Pay kitemark that hotel and restaurant chains could get only if they treat their staff well, including paying a reasonable wage. That would force them to look more closely at their contractors if they don't employ the staff directly. It could become as important as Fair Trade is to coffee shops and supermarkets. This is an area where consumer power could and should make a difference. I have written the cover feature in this week's Public Finance, looking in detail at the Conservative plans for schools, drawing on an interview with the shadow schools secretary Michael Gove. My argument is that there is rather more in common between Labour and the Tories on structural reforms such as academies and school chains than either Ed Balls or Michael Gove would care to admit. But there is a bigger difference over the curriculum and the wider purpose of schools. You can read the article here. In 2007/08 there were some 780 appeals lodged by parents against the permanent exclusion of their child. This represents a decrease of 25 per cent since the previous year. Of the appeals heard, 26 per cent were determined in favour of the parent, which represents an increase of 1.3 percentage points since the previous year. Of the appeals determined in favour of the parent, reinstatement of the pupil was directed for 35 per cent of cases, a decrease of almost 5 percentage points since the previous year. To put that last bullet point in simple terms, there were just 60 - that's sixty - successful appeals where pupils were reinstated as a result of the appeal in the original school. That's 60 cases out of 8,130 permanent exclusions, out of 7.3 million pupils, where the head's decision was not effectively upheld. Does David Cameron really believe that those 60 pupils are responsible for all the discipline problems in our schools? I have also written about this issue on the Public Finance blog. After a week of virtually non-stop rain, I can understand why Michael Fish would want to blame the media for misinterpreting the apparently cautious predictions of his colleagues about a 'barbecue summer'. He would have a point if the phrase had not appeared so baldly in the Met Office's press release along with several other bullish statements. Here are the first three paragraphs from the press release issued on 30 April 2009 in their entirety. Although the forecast is for a drier and warmer summer than average it does not rule out the chances of seeing some heavy downpours at times. However, a repeat of the wet summers of 2007 and 2008 is unlikely. As someone who has written more than my fair share of eye-catching press releases, I know that the best way to get a story is by providing a lively phrase or two alongside a few surprising statistics. So nobody could blame the press office for doing that, or the media for picking up on such apparent good news. Those who should take the blame are Fish's former colleagues who allowed the predictions to go out with so few caveats. In the 1990s, he was a dynamic and ambitious young activist in a rightwing, nationalist, xenophobic party, the Christian National Union. In 1999, he visited Britain to present what is described as a gorget embossed with an image of the Virgin Mary to General Augusto Pinochet. "This was the most important meeting of my whole life. Gen Pinochet was clearly moved and extremely happy with our visit," Kaminski told the BBC's Polish service. In a short video clip from July 2000, he describes homosexuals as pedaly, a slang term roughly translatable as "queers" or "poofters". In 2001, he became involved in one of Poland's greatest post-1989 historical controversies, about the murder in July 1941 of almost all the Jewish inhabitants of the Polish village of Jedwabne – a murder committed by Polish villagers. As the local MP, he denounced the post-communist president Aleksander Kwasniewski for his readiness to apologise in Poland's name for this crime. It does rather put Cameron's lavatorial language on Absolute Radio in the shade. She would be giving up "broadcasting opportunities" to run, she told the BBC. If you haven't voted yet in the Total Politics 2009 poll, please do so. And if you enjoy this blog, I hope you will include it prominently in your Top 10. You can click on the link on the right hand side or email toptenblogs@totalpolitics.com. This year's poll is being promoted/sponsored by LabourList and LibDemVoice as well as Iain Dale's blog. The rules are simple. 5. Only blogs based in the UK, run by UK residents are eligible or based on UK politics are eligible. 7. All votes must be received by midnight on 31 July 2009. Any votes received after that date will not count. Of course, it could be argued that this doesn't say anything new, and he assures us that he doesn't wish to pre-empt a review which is likely to see fees increase from £3225 to between £5,000 and £7,000 a year some time after a 201o election. Both main parties are happy for a review to report then, as happened with Dearing. And neither party will want to argue the case for an increase. But today's speech suggests a rise is inevitable, not least if universities are expected to bear cuts in their grants after 2011 with the main parties trying to protect schools, hospitals and overseas aid. After all, the notion that fees that are paid by income-earners after graduation are deterring would-be students is hardly borne out by the record numbers of applicants this year, after several years of rapid rises. Even the Lib Dems seem set to abandon their opportunistic opposition to fees. This shouldn't mean that universities don't have to make a better case for a fees increase than they have been making to date. Universities need to make more of their wider contribution to the economy and society, through research and teaching, or their role with schools in lifting aspirations and improving social mobility. They also need to do a lot more to show students that they are getting a good deal, with first-class teaching and learning resources. These too should be a part of the review of fees. After all, getting students to apply is only a start; ensuring they get the most from their university experience matters just as much. Let's not beat around the bush. The result in the Norwich North by-election is an awful result for Labour (and for the Lib Dems and Greens, incidentally, since Labour did at least manage to keep second place) and a good one for the Conservatives and their candidate, Chloe Smith. This was an entirely avoidable by-election caused by inept handling by the Labour party of the expenses saga in the case of Ian Gibson. As I said yesterday, the government has been doing some good things in recent months and has a greater clarity of purpose. But it has largely failed to get a sense of this across to the public. If Labour is to recover any of its position in the months ahead, it must be much clearer about what it is about, more honest about the consequences of the recession on public spending and much better at getting its message across. Will the Tories let schools decide on setting? The Daily Mail angrily reports another supposed betrayal in education. Only 45% of lessons are apparently set by subject ability in secondary schools, so a Labour pledge to encourage - not enforce or require - the practice has "not worked". Cue charges of betrayal. Yet, if Nick Gibb, the shadow schools spokesman is to be believed, this is an increase from 37% in 1997. (For some reason, Gibb uses 2002 as a baseline for his Mail onslaught, not 1997). But a more accurate figure suggests it was only 34%, given that 1996-1997 should be the baseline. And given that the practice was on the wane before 1997, Gibb's earlier figures suggest that a fifth more lessons are being set; the actual figures imply a quarter more. More importantly, a far greater proportion of maths and English lessons are set. Most schools don't take an ideological position on setting; they do so pragmatically in some subjects, and not in others. The 45% figure includes all subjects, and teachers are often reluctant to set when take-up of subjects is relatively small or in subjects like religious education. There are also big differences in year groups. But all this poses a bigger question for Nick Gibb. Given that the Conservatives would not force setting on schools to which they are supposedly granting greater independence than Labour, how exactly would they insist on setting in every lesson in every subject? The last few months has seen more productive activity from this government than the previous two years. With today's long overdue announcement of plans to electrify the rail lines to Wales and the West, another sign of Andrew Adonis's hyperactivity at transport, we have seen a government willing to grapple with several big issues that had been largely neglected in the past. The recent proposals on care for the elderly and on energy are other good examples, and there have been continuing economic and public services reform proposals. And the management of the flu crisis has to date (despite a phoney media crisis at the weekend) been well managed. Of course, the problems in Afghanistan will inevitably overshadow this work, as probably will tonight's Norwich results (though I couldn't resist a small 8/1 bet on Labour a few weeks ago). And the rushed attempt to appease the media over MPs expenses have had to be watered down. But the idea that this is a government that has run out of steam has been shown to be so much media narrative. The challenge for the government is to get past that sense of inevitability about Cameron come the autumn. For the truth is that in many policy areas, the Tories have still not got much to say, and on issues like health, what they do have to say is deeply dispiriting. The only shame of it is that this bout of serious policy came two years into Gordon's premiership rather than two months. Alan Milburn has produced a characteristically sharp and focused report on social mobility. His commission builds on a lot of excellent work over the years by the Sutton Trust, which had started to identify the 'closed shop' that had grown in many professions. As the report makes clear, this is not about dumbing down, the charge wearily made by some newspapers at any effort to provide a level playing field. Increasing fair access to professional careers is not about ‘dumbing down’ any more than it isabout allowing young people who would otherwise not be bright enough to become doctors or lawyers. It is about making current access routes fairer and ensuring that those young people who succeed in gaining a top job do so on the basis of talent and merit alone. What's interesting about the report is its recognition that this is about more than just attainment or having more good schools, desirable though both clearly are. The advantage that many children of professionals enjoy include less tangible factors such as contacts, access to internships and confidence. It is vital that those skills are developed in state schools, and there has been a considerable growth in the number of specialist schools and academies that place great emphasis on them in recent years. The debate on the curriculum has got bogged down into an unhelpful split between 'knowledge' - traditional subjects - and 'skills' which can include these social and communication skills, but also embrace everything from health education to citizenship. Clearly students need both, as the Milburn report makes clear. And there are plenty of practical proposals on everything from mentoring to flexible degree courses. But we also need a sea-change in attitudes among the professions (there is evidence of some improvement in the law, but none in medicine). The predictable guff about this being still a problem after 12 years of Labour misses the point - indeed Alan Milburn points out that a long decline in social mobility has bottomed out under this government. State schools have improved considerably. More state pupils go on to university, and more do so from poorer areas. But without the sort of social skills that the professional classes effortlessly pass on to their offspring, we will never narrow the gap. And without a greater sense of ambition in young people themselves, they won't take up the opportunities on offer, which is something that families and teachers can instill. In the end, we need a cultural revolution as much as government action. With predictions of seven million more professional jobs over the next ten years, nothing less will do. Was Damian McBride right to speak out? I've listened to the very long Radio 5 interview with Damian McBride and read the interview in today's Media Guardian. He has done a fairly professional job in getting across his point of view, and in killing a few of the more outrageous things that were said about him. And by feeding the media he should be allowed to get on with his new school job without hassle from journalists. So, in that sense, I can understand his doing the interview. But it has also done a lot to revive memories of an unsavoury episode in recent government history, one that preceded the MPs expenses saga but probably contributed as much to the terrible poll results that Gordon has had since. So, the government could certainly have done without it. As for the content of the interviews, I only knew McBride by reputation, so I have no idea whether or not he did much of the briefing that is attributed to him. What I do know is that his argument that he had to engage in some sort of briefing war with people he describes as Blairite 'ultras' like Charles Clarke, Alan Milburn or Stephen Byers suggests that he lacked a sense of proportion at best and that he made a serious error of judgment at worst. Special advisers who deal with the media should not indulge in serial briefing against senior figures in their own party, briefing which also seemed to go on when these people were ministers. That this seems acceptable to McBride may go a long way towards explaining why Gordon Brown has had the difficulties he has had since becoming PM. The total disinterest in European politics in this country means that there has been virtually no scrutiny of the new odds and sods group to which the Tories now belong in the European parliament. But the Observer today reveals more about the mindset of the Michal Kaminski, the man chosen by David Cameron to be its leader. Over recent years a series of investigations have shown that Polish residents of Jedwabne, along with some German troops, rounded up the Jewish population in July 1941 and herded them into a barn which was set on fire. At a ceremony in Jedwabne on 10 July 2001, the then president, Aleksander Kwasniewski, called for the country to confront its past and apologised. But many in Jedwabne opposed the ceremony and apology, claiming that the Germans were mainly to blame and that Poland should not say sorry because Polish Jews had "collaborated" with the Soviet occupiers. An article in the far-right Polish newspaper Nasza Polska on 20 March 2001 quoted Kaminski as saying: "Maybe they try to suppress their own guilty conscience, those Jews who did a lot of harm to Poland during the Soviet occupation and during communism." Kaminski denies making the comments though respected Polish newspapers report that he was part of this campaign. Either way, Rabbi Marcus is surely right to demand that Cameron dissociates himself from these views. According to Sir Malcolm Rifkind, defence secretary under John Major from April 1992- July 1995, on Today this morning, "people weren't dying on a regular basis" in Bosnia during the time he held that post and presided over serial inaction. war broke out on 5 April 1992, when Bosnian Serbs besieged Sarajevo.....by mid 1995 the factions had almost fought themselves to exhaustion and rough equilibrium. NATO launched air strikes against Bosnian Serb positions from late August to mid-September to force them to the negotiating table, and a US brokered cease-fire came into effect on 5 October 1995. The Bosnian death toll after the war was originally estimated at around 200,000 by the Bosnian government. This figure is still often quoted by the Western media. However, the most recent research places the number of victims at around 100,000–110,000 killed (both civilians and military), and 1.8 million forcibly displaced. To see a very fine revival of David Storey's Home, part of the annual Peter Hall summer season at Bath's Theatre Royal. 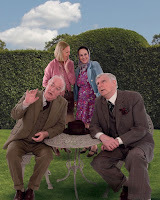 A short play with echoes of Beckett it focuses on four main characters in what initially appears to be the garden of an old folks home but turns out to be rather less straightforward. The dialogue in the first act follows an apparently inconsequential conversation between the principals - played with aplomb by David Calder and Stephen Moore - while subsequent acts bring in two female inmates - an amazingly disguised Lesley Joseph and Nicola McAuliffe - and their own eccentricities and foibles. The story is slight, but the script is in turns sparkling, witty, shocking and poignant , and shows no sense that it it is dated by its 40 years. Home runs in rep until 1 August and is well worth seeing. Recent trends have been contradictory when it comes to local government. Both Labour and the Conservatives want to give councils the chance to build more social housing, for example. ‘I think it’s localism,’ declared shadow housing minister Grant Shapps at the weekend. But with schools it is different. Both parties want more independent academies, though Schools Secretary Ed Balls wants them to work more with local authorities while his Tory shadow Michael Gove believes that parents might want to help run his new academies. In truth, most such schools are likely to come through ‘chains’ of like-minded schools, such as Ark or the Harris Trust, which already run several academies each. Instead of through councils or parent power, many schools are likely to develop as part of national brands. But this reduction in local council power is coinciding with less national accountability. The government’s flagship literacy and numeracy strategies are to be abandoned (though Ofsted will still inspect for daily lessons in the 3Rs). Labour has ditched national tests for 14-year-olds, while the Tories would get secondary teachers to test and mark primary pupils in place of the national tests at age 11. And while both parties stress the need for more published information, there is a growing hostility to national targets. In health, an incoming Conservative government would leave decisions on minimum waiting times to individual hospitals. Prime Minister Gordon Brown has recently announced plans for entitlements setting out treatment times for cancer patients and guaranteeing personal tuition to school children. There were certainly too many targets, and some were clearly counter-productive: although quickly abandoned, targets to reduce school exclusions came to be seen as a cause of poor discipline, and skills targets focused on qualifications rather than what employers really wanted. But centrally driven programmes, such as the literacy and numeracy strategies, did a lot to counter past failings. They reintroduced spelling, grammar and punctuation to writing lessons; they put times tables back into primary maths; and they used phonics to teach reading. And despite the decision to scrap the national programmes, both the national curriculum and Ofsted inspections mean that such traditional approaches are likely to remain whoever is in power. Why are the Tories descending into partisan pettiness? A couple of years ago, David Cameron was keen to stress the all-embracing nature of the new Conservatives. They were nothing less than the new Blairites, he trilled, though not all of us were convinced. But the message was clear: the partisan nastiness so aptly identified by Theresa May in her evocation of the 'nasty party' was a thing of the past. Voters who had shifted to Labour could turn to the new cuddly Tories safe in the knowledge that they had the national interest, rather than the partisan concerns of a minority of right wing obsessives, at heart. Of course, in getting elected, David Cameron had to throw a few crumbs to the obsessives, pledging to abandon the European Christian Democrats in favour of a barmy alliance of fringe parties cobbled together among the also-rans of Europe. Nobody believed he really meant it. And then it came to pass. The Tories now sit with the Latvian Waffen SS memorial party, while decent middle of the roaders like Edward McMillan Scott are booted out. And when there is a real chance that one of the greatest British politicians of our age could become the President of Europe, what is the considered response of the man who would be Cameron's Foreign Secretary? "He should be let nowhere near the job," he says, using the sort of diplomatic skills normally apparent in UKIP. Tony Blair often put the national interest above partisan interests, appointing able Tories like Chris Patten to key posts in Northern Ireland, for example. Is it really too much to expect David Cameron to do the same? The outrage that has greeted news that the Charity Commission has flexed its muscles a little over schools that regard the fulfilment of their charitable mission as being the staging of plays in local care homes and allowing a church youth group to use its playing field, is absurdly overdone. The Commission has accepted that schools like Manchester Grammar, which provide bursaries for 14 per cent of pupils and train teachers from other schools at home and abroad, are making a serious effort to fulfil their original charitable purpose. So this is hardly some political vendetta against independent schools. Nobody is denying parents the right to pay thousands of pounds a year for a private education. The only issue is whether providing an expensive fee-paying education by itself is a charitable mission. It clearly is not. The schools can choose to widen their charitable role, so that they meet the definition of a charity, or to reject charitable status. The same applies to the care homes that have come under the Commission's scrutiny today. However, the Commission is itself being disingenuous in refusing to offer better guidance to schools on what would count as the fulfilment of a charitable mission. If it believes that a minimum of 10 per cent of places should be the subject of bursaries or that a school should contribute a particular level of value to its community, it should say so. After all, schools that are inspected are usually clear what Ofsted is looking for. They have the right to similar clarity from the Commission. I've just been watching the sheer brilliance of Jimmy McGovern's latest series of The Street on BBC 1, with superb performances by Bob Hoskins, Liam Cunningham, Frances Barber, Ger Ryan and Timothy Spall in a tale of one landlord's principled stance - and sweet revenge - against a local gangster's bullying. As with earlier series, the acting is great, the storyline gripping and the drama intense. It is everything that good TV should be. And it is for this - rather than the dismal makeover and 'reality' shows that too often dominate the schedules - that we pay our licence fee. David Cameron was at his sanctimonious best a few weeks ago when he saw an opportunity to get rid of troublesome backwoodsmen over their duck islands and moats. Politicians have done things that are unethical and wrong. I don’t care if they were within the rules – they were wrong......I want to establish the new principles that we will abide by. I’ve said that the thing we need more than anything else in this country, the idea that will be at the heart of everything a Conservative Government will do, is responsibility. Now that it has become clear the extent to which outrageous and illegal bugging of celebrities and senior politicians like Tessa Jowell, John Prescott and Boris Johnson was carried out and planned while his communications chief, Andy Coulson, was deputy editor at the News of the World, surely there can be absolutely no ifs or buts about it. Coulson must go. Otherwise, we must conclude that there was nothing more to Dave's recent righteous indignation than sham PR bluster. This post has been picked up on the Guardian's politics blog. I've posted at the Public Finance blog on David Cameron's plans to cut quangos, where I question the main examples chosen by Cameron. David Cameron has been vying with the government in the battle to be nastiest to quangos. Embarrassingly for the Conservative leader, Labour has shown that his plans would involve another 17 quangos, including an independent board to run the NHS – removing ministerial accountability from one of the most sensitive public services. Beneath the rhetoric, there is some sense to the Cameron justification for a quango’s existence, that it should offer technical advice, impartial decisions and transparency. And there are undoubtedly too many quangos, not least in areas such as regional policy and skills. 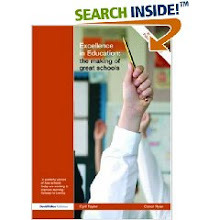 national curriculum, qualifications and national tests. All these are areas where it is unwise for politicians to take decisions, although, of course, ministers should be consulted on important changes. They all involve technical advice, impartial decisions and transparency. What this implies is a much more hands-on (dare one say it, centralist) role for government under a future Tory administration. Similarly, it makes sense for communications regulator Ofcom to be at arm’s length from ministers, given the sensitivity of decisions about the BBC. It is simply daft to suggest that such an organisation should not have a small research and policy arm – and it is a lot better at it than most departmental research units. Of course, ministers should make decisions and be accountable for them. And the lines of accountability for quangos could be better drawn. But the truth is that once Cameron really tries to wield his axe, he’ll find it is a lot harder – and less palatable – than it looks. Do also read Will Straw's analysis showing how Cameron can't make the promised savings from axing quangos, at Labourlist. There's not much that David Miliband and John Major agree on. But the total lack of proportion shown by the BBC in leading with the silly story about John Sawers' wife's Facebook site presented a rare show on unity on this morning's Marr show. One expects such faux-scandals to dominate the Sunday redtops. On a day of crisis in Iran and Afghanistan, it should not be leading the BBC TV and radio bulletins. We've just returned from a good holiday in the South of France, which finished with three days in the buzzy environs of the Vieux Port in Marseille. But our departure from Marseille Airport presented a less happy spectacle. We were flying EasyJet back to Bristol, and were forced to depart from a ghastly shed designed to house budget airlines - mainly Ryanair - known as MP2. The taxi dropped us at the main terminal and trolleys are blocked from MP2. MP2 doesn't take your bags at check-in; instead you must carry them past another checkpoint and load them on a baggage rail later. You then face long surly queues for security, followed by a passport queue. Although there are a few shops in the terminal, the departure gates area is seatless, and you must stand for ages waiting for the flight to land. This is the future that Michael O'Leary wants for all fliers. And it is not a pleasant one. The final White Paper package showed imagination, with the five-yearly teachers' MOT providing a surprise addition on the day. It makes sense to ensure teachers' skills are up-to-date, though it will be important that the focus is on what matters to good teaching, and not on simply reinforcing passing fads. But given the reluctance of too many governing bodies or heads to remove incompetent teachers, it is potentially a good move. And it is good that the government apparently plans to continue to publish performance table data alongside the Report Card: all the data should be on a single government website if it is genuinely to be accessible. More details are obviously needed on what is to replace the Primary Strategy in terms of quality and pressure to improve, and it remains to be seen how good School Improvement Partners are in their extended role, but with the reinforcement of the importance of trusts and academies, this is a reforming package. It places a considerable onus on the Tories now to give real detail about how they would do things differently.